You can get two Google Home smart speakers for $130. 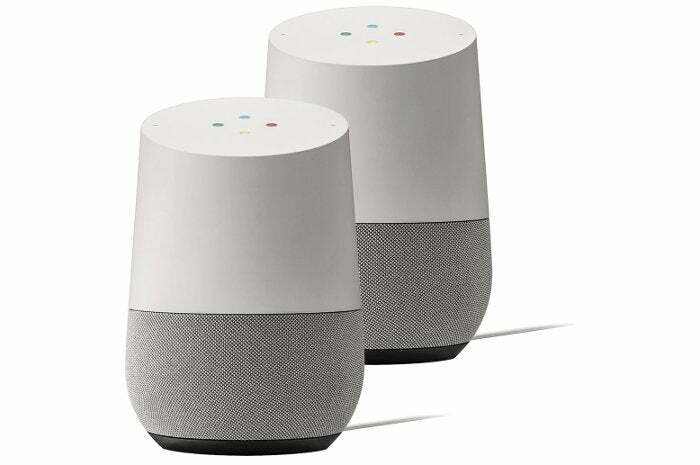 Best Buy has a nice two-for-one deal today: Right now, you can get two of Google's voice-activated smart speakers for $130. It's not clear when the deal will end, but it appears to be a daily doorbuster that will likely expire by the end of the day. While the Google Home hasn't typically budged from its $129 price tag, the smart speaker has seen a lot of discounts lately--in addition to this deal, it's $79 right now on the Google Store. Google's Echo competitor is a great choice for people who are already integrated into Google's ecosystem. (For example, you can use it with Google's Chromecast streaming device to call up Netflix videos via voice commands.) It also works with a number of third-party smart home device makers including Honeywell, Logitech Harmony, Nest, Philips Hue, SmartThings, and TP-Link Smart Home. Besides smart-home integration, Google Home can connect with music services such as Pandora and Spotify, provide on-demand information, set timers and alarms, report the weather, traffic, and all kinds of other things you'd use Google for. It can also make phone calls in the U.S. and Canada. Plus, the Google Home has the added ability to "call Santa" during this holiday season.